The Explorers' Dome is located on the second level of the Viking Orion's Explorers' Lounge. Viking Orion, the newest Viking Ocean Cruise ship, made its debut in Italy on June 14, revealing a unique high-tech feature: a planetarium at sea. The ship is named after the constellation Orion (the hunter) and NASA's Orion spacecraft, the first crewed capsule designed to carry astronauts beyond low Earth orbit. The ship's name also honors retired NASA astronaut Anna Fisher, who is the "godmother" of Viking Orion and worked on the Orion spacecraft before retiring in May 2017. "The Explorers' Dome onboard Viking Orion is currently the highest-definition 7K planetarium in the world," Ralph de Klijn, Viking's executive director of ocean operations, told Space.com. "The Explorers' Dome is a versatile space that can operate as a high-tech planetarium, as well as show films and other programming in 2D or 3D." The Explorers' Dome currently offers two 3D films: "Journey to Space" and "Under the Arctic Sky." Viking Orion is only the second cruise ship in the world to have a planetarium; the other is the Queen Mary 2, an ocean liner of the Cunard Cruise Line. 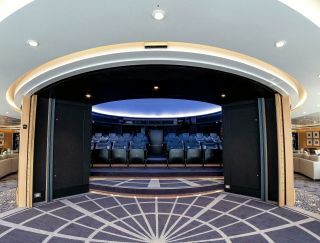 Although Viking Orion is not the first cruise ship to offer a planetarium, the company says this one is the most advanced, with a Digistar 6 display system, five projectors and studio speakers. The addition of the Explorers' Dome on Viking Orion is viewed as a piece of "art," according to Viking. Joined by a NASA photo exhibit, the artwork on board pays tribute to the spirit of exploration. "And, of course, there is a natural connection in having a planetarium on board a ship that is named for the prominent Orion constellation, [and] whose godmother is a retired NASA astronaut," de Klijn told Space.com. However, the planetarium is not necessarily something that will be included on other Viking Cruise ships. "Viking's guests are curious explorers," de Klijn said. "We are always evolving the onboard and on shore experiences to provide additional opportunities for learning — the Explorers' Dome is one of the newest examples." In addition to the Explorers' Dome, the ship will have a Viking resident astronomer. Howard Parkin, a Royal Astronomical Society fellow and founding member of the Isle of Man Astronomical Society, will lead lectures on the wonders of the cosmos and offer guided tours of the night sky during stargazing sessions using Viking's portable telescope. While other Viking ships have resident historians, Orion is the only one with a resident astronomer and historian. Parkin will continue to offer lectures through the ship's 2018 maiden season, de Klijn said. Editor's note: Samantha Mathewson traveled on an invitation from Viking as part of an unpaid media preview event for Viking Orion.